Who Better Than Kit Summers to Help Your Business, Employees, Students and You Advance? Since 1975, “Success with Finesse” has been educating, inspiring and entertaining thousands of people around the world to find strategies for advancement. Kit’s compelling story gets the participant’s attention. Using the metaphors of juggling and magic, Kit presents a variety of messages that enhance effectiveness and productivity in others. As you’d expect – his inspirational approach is as entertaining as it is motivating. Kit is a dynamic speaker who believes learning to overcome obstacles and dealing with change can be fun! Everyone Wins. Kit leaves participants thinking, laughing and eager to apply what they’ve learned. Participants report that they are more productive, effective and creative in their business, schooling and personal life. The benefits are limitless as participants learn to awaken their mind and move up to a higher level. And that makes everyone happy! Wisdom, humor and juggling collide to create an unforgettable and moving experience. Kit will inspire and motivate participants to imagine a bolder vision for their lives and teach them how to bring that vision to reality. Success greater than they ever thought possible! BOOK KIT NOW! He will customize his presentation to the specific needs of your organization, school or business. 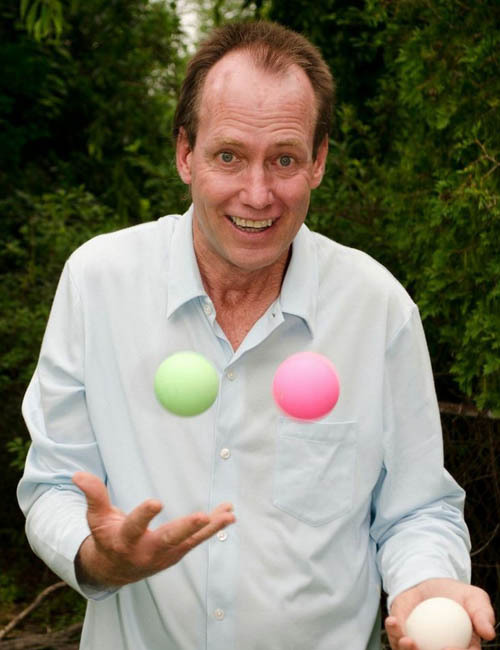 His riveting, one-of-a-kind combination of motivational speaking and juggling will keep participants at the edge of their seats. He will inspire your audience with his personal story of triumph over incredible adversity. He will give your audience practical tips they can put into practice immediately in their everyday lives. His wisdom comes from real-life experience not only overcoming incredible odds, but using the adversity to achieve greater success than ever! Kit Summers will design an entertaining, high-quality, high-impact presentation that is tailored to your needs and that will get the results you want. Have Kit work with your business, organization or school to bring out the best in your people. What Does Kit Talk About? How to take charge of the mind and direct thoughts toward goal achievement. Learning to change with the changes means learning to use the mind effectively. Kit shows participants how to use their brain in a more efficient and focused way. How to adjust positively to change. Without change, life would be so boring. How we learn to deal with change can lead to success or failure in life. By teaching participants to see change as an avenue of constructive growth toward success, Kit helps them to adapt positively to change. How to learn from adversity. Using humor, Kit gently reminds audience members that growth depends on the ability to learn from experience. This effective speaker shows them how to move forward with finesse to the promise of a better future. How to overcome obstacles that stand in the way of success. Taking charge of your mind and directing your thoughts is the essential groundwork that must be done in order to have a successful life. Yes, we can all find the success that is meant for us. How to use specific and practical ideas to meet the challenges of school, career and life. More than just “You can do it,” Kit leaves participants with the know-how to meet challenges in all walks of life. We can all stretch beyond the potential we think we have! The benefits are limitless as your people learn to awaken their mind and move forward with finesse toward a better future. How about this, if “Success with Finesse” doesn’t meet all of your needs for a speaker, you can have your money back, no questions asked. With that kind of guarantee, how can you pass this up?